small farmer tea | Small Farmers. Big Change. 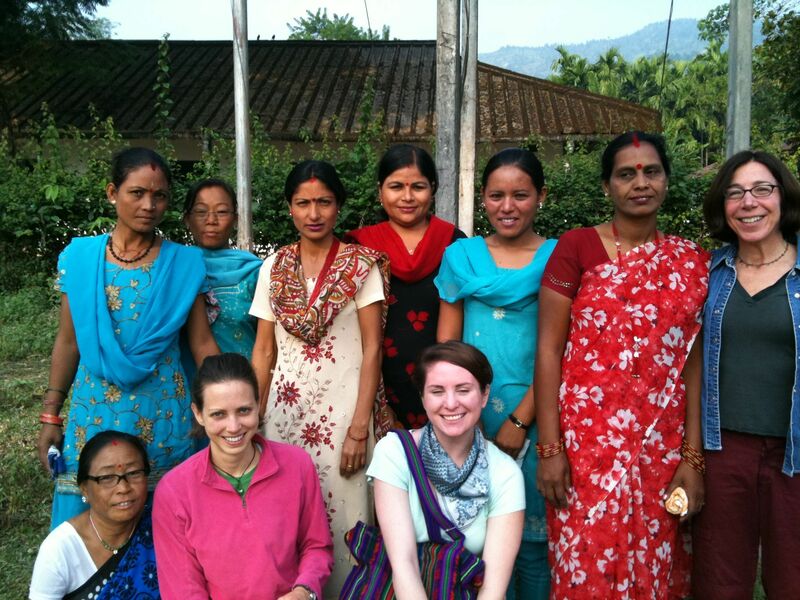 We’ve just completed a very fun and information-packed 10-day visit to India where four of us from Equal Exchange had the opportunity to visit our partners, Tea Promoters of India (TPI). 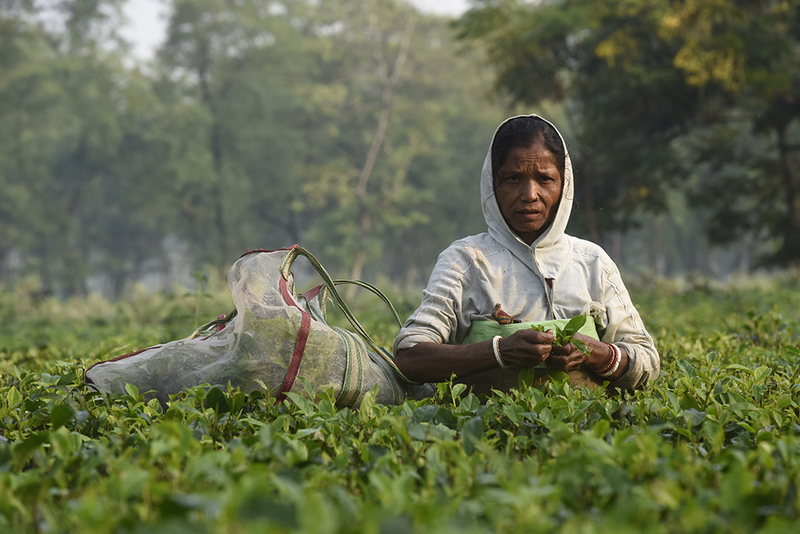 We spent a week visiting a handful of the tea gardens, small farmer co-operatives and factories in Darjeeling and Dooars that are growing and processing our line of teas from this exquisitely beautiful region. I’m still away on vacation, so the full story – and best photos and short videos – are yet to come. For now, I just wanted to share a few random photos to give you an idea of some of our activities. We arrived at Putharjhora Tea Gardens in Dooars after our long flight to Delhi and then another to Bagdroga (West Bengal). Our first meeting was held late in the evening and began with a ceremony in which we were officially greeted with rice, scarves, and garlands. We then watched a variety of dance performances… soon we will have short video clips for you all to see as well. 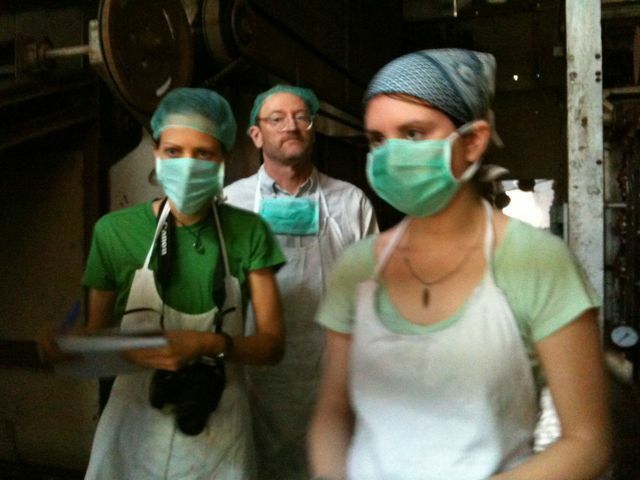 Above, Jodi Anderson, Sales Manager, Rink Dickinson, Co-Director, and Danielle LaFond, Quality Control Technician don masks, hair nets, and other protective gear to tour the tea processing factory at Putharjhora Tea Gardens. This is where the tea leaves are dried, rolled, sorted, and packed. 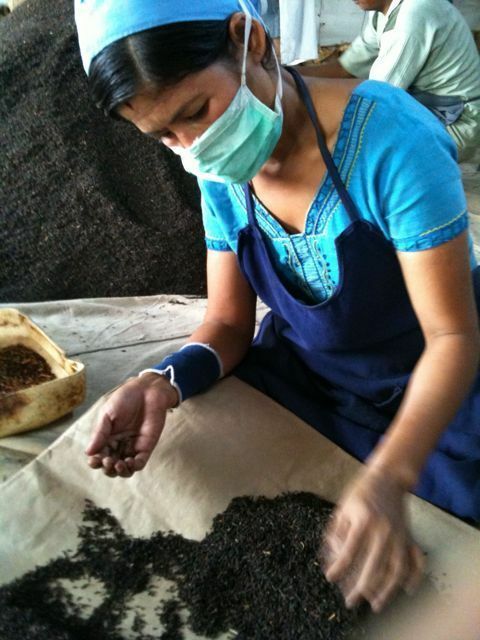 A tea worker is removing the stalks and stems from the tea leaves. Danielle tries her hand at sorting. 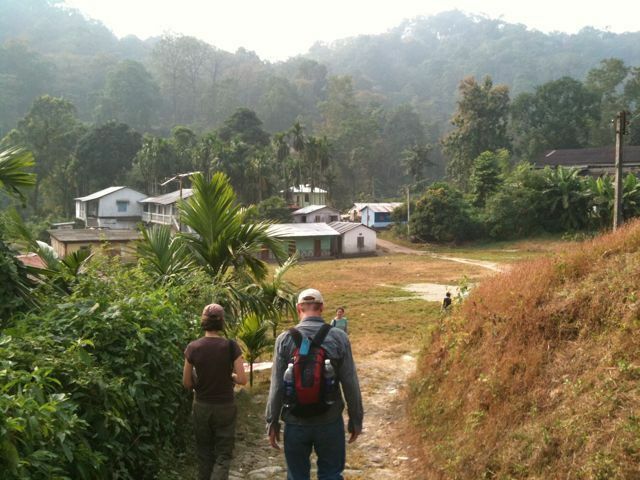 Jodi Anderson and Rink Dickinson get out of the car and walk the last few kilometers into the Potong Tea Garden in Darjeeling, the foothills of the Himalayas. This is the first tea garden where ownership was turned over to the workers. In a meeting with the worker-owners, we were told the long history of events leading to the decision of the workers to buy the garden and take over the management. An incredible story which we will tell soon. We ended our trip in Calcutta, where TPI’s offices are located. 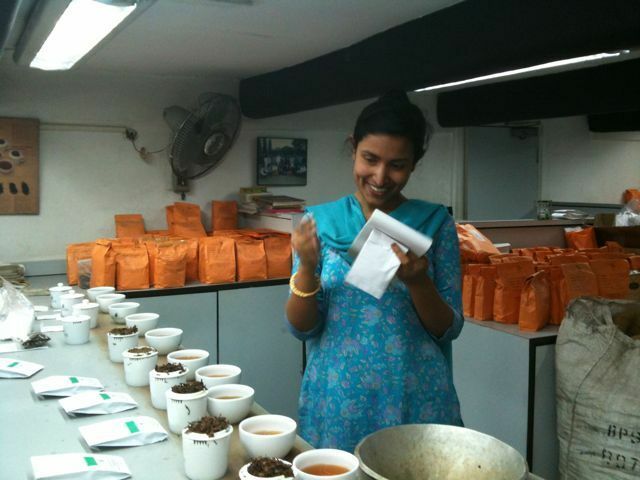 Above, Smeeta Ray did a tea tasting with us and Danielle, Rink and Jodi chose the finest quality and best tasting teas to purchase in our next shipment. 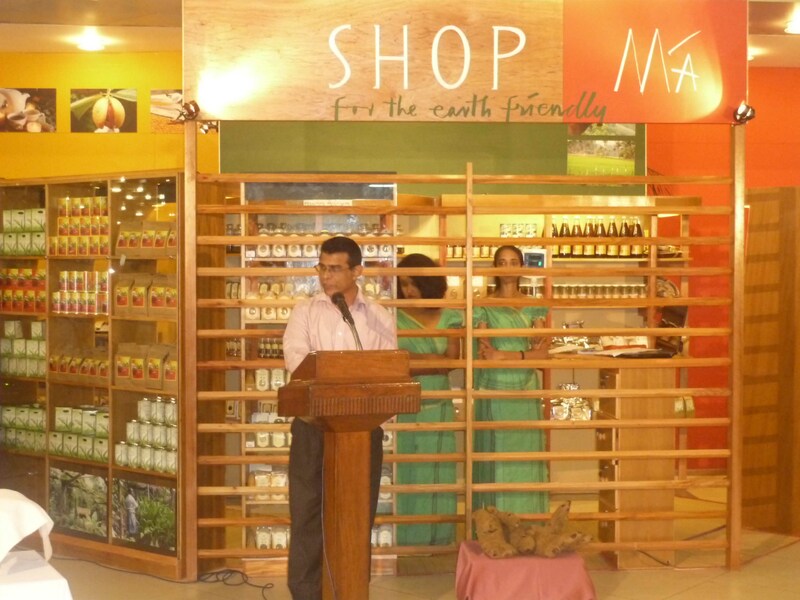 It was probably no coincidence that all of the teas they chose came from TPI’s small farmer projects. Following our meeting in Potong, we took a group photo and then were invited to someone’s house for one of the most delicious meals we had on the trip… and there were many, many of those! 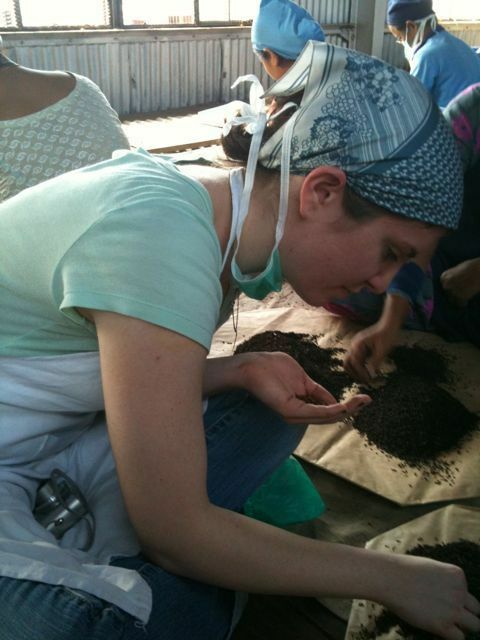 Most importantly, we learned an incredible amount about the tea we purchase, the cutting-edge company we are working with and the people who are working incredibly hard to produce this tea. 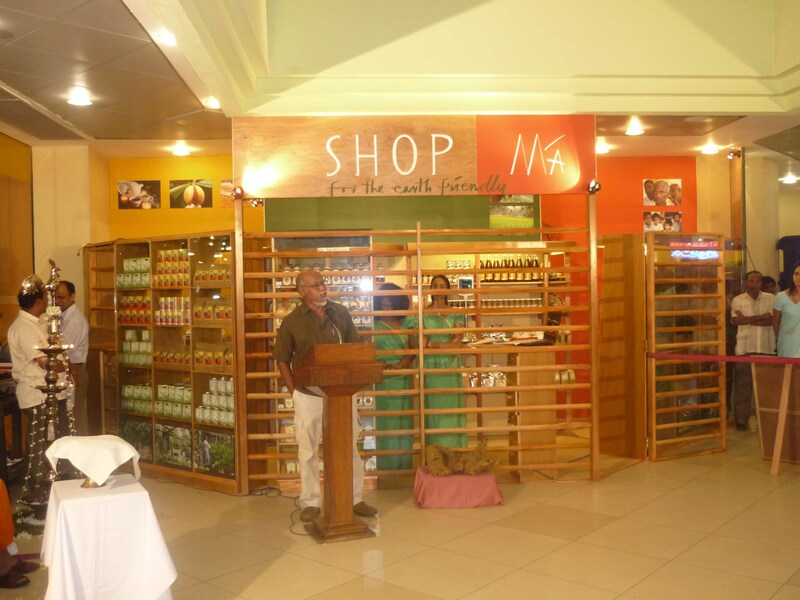 TPI is working with a number of tea gardens and they are on the forefront of the movement to organize small farmers into co-operatives and to organize former plantation workers into co-operatively run enterprises. We were able to see a wide range of these projects and look forward to sharing more in the weeks to come!